On Tuesday, February 12, 2013 at 2:57 GMT/UTC, North Korea tested its third nuclear device. The official KCNA news agency stated: “It was confirmed that the nuclear test, that was carried out at a high level in a safe and perfect manner using a miniaturised and lighter nuclear device with greater explosive force than previously, did not pose any negative impact on the surrounding ecological environment.” Much information is still unknown about the nature of North Korea’s nuclear test and thus caution is warranted in interpreting this test. And the question remains. Can North Korea miniaturize its nuclear warheads to fit on its ballistic missiles? With North Korea having shown greater competence in launching an intercontinental ballistic missile (ICBM) capable of reaching the continental United States, the discussion about North Korea’s ability to mount a nuclear warhead on such a missile is more pressing. Although such a prospect appears to be several years off, the chance that North Korea could mount and deploy a warhead on the shorter range Nodong missile is a more critical concern. Moreover, North Korea has given indications that it is thinking about deploying its nuclear weapons on such delivery systems. So far, North Korea has not overtly deployed Nodong missiles with nuclear warheads. There appears to be no public evidence of covert deployments of such missiles. However, the lack of any deployment of nuclear-tipped Nodong missiles does not mean North Korea cannot do so. At ISIS, we have assessed for some time that North Korea likely has the capability to mount a plutonium-based nuclear warhead on the shorter range Nodong missile, which has a range of about 800 miles, and that Pyongyang still lacks the ability to deploy a warhead on an ICBM, although it shows progress at this effort. North Korea would need to conduct missile flight tests with a re-entry vehicle and mock warhead, increase the explosive yield of the warhead (possibly requiring its further miniaturization), and improve the operational reliability of the warhead and missile. Accurately assessing North Korea’s progress in building deliverable nuclear weapons is never easy since it is intensely secretive and U.S. intelligence gathering capabilities are limited. The North often publicly exaggerates its capabilities to boost its perceived nuclear deterrent. Analysts are left to try to draw conclusions based on partial information, and as a result, there are notable differences on most nuclear weapons issues. The miniaturization debate is no different. Analysts of all opinions are unable to know the true situation and can assess only the estimated state of North Korea’s progress. The U.S. intelligence community has also not been of one opinion on the issue of North Korea’s ability to miniaturize and deploy a warhead on a missile. According to a U.S. official, key members of the U.S. intelligence community have for many years given North Korea credit for being able to produce missile-deliverable nuclear weapons. However, the official said that this conclusion is based on an assessment and not concrete evidence of such a capability. There are of course questions about the warhead’s reliability, predictability, safety, and security. It is unlikely to be akin to a U.S. warhead, which must meet incredibly stringent criteria in all these areas. North Korea may have settled for less stringent criteria. It may opt to allocate more than one nuclear-tipped warhead to each target. Further underground nuclear tests will result in data that can improve the nuclear warhead’s reliability. There are several points of evidence that lead to the conclusion that North Korea can miniaturize sufficiently for Nodong missile delivery. They include the duration and purpose of the nuclear weapons program, comparisons to other countries’ experiences, and its two earlier underground nuclear tests. One reason that North Korea can likely miniaturize its warheads by now has to do with the sheer duration of its nuclear weapons program. North Korea’s weaponization work can be traced back to the 1980s. In those early years, China may have provided assistance in terms of nuclear weapons data and designs. Until the mid-to-late 1980s, China was not opposed to nuclear proliferation. In the early 1980s, it provided Pakistan with 50 kilograms of weapons-grade uranium and a nuclear warhead design. An early indication of North Korea’s work on nuclear weapons was the existence of a high explosive test site abutting the north end of the Yongbyon site suspected to be related to the development of nuclear weapons. In the late 1980s and early 1990s, the North was known to have conducted high explosives tests at this site. Media reports, based on other countries’ overhead imagery, stated North Korea had conducted about 70 high explosive tests. In 1992, soon after North Korea signed its safeguards agreement, the International Atomic Energy Agency (IAEA) sought to take samples at this site to determine whether uranium had been used in any of the high explosive tests, an indicator of nuclear weapons-related development. North Korea allowed a visit to the site but denied the inspectors’ request to take samples. The issue was left unresolved. After the U.S.-North Korean Agreed Framework was signed in 1994, the media reported that, based on information from U.S. officials, the North continued testing high explosives at another site, apparently as part of on-going nuclear weapons development. After the demise of the Agreed Framework in late 2002, North Korean statements and actions indicated it was working on developing and possibly building nuclear weapons. In the early 1990s, the CIA estimated that North Korea had a first-generation implosion design based on plutonium that was likely to be deployed on the Nodong missile, which North Korea was developing at the time and first flight tested in 1993. Focusing on missile delivery would lead to a more credible deterrent. North Korea’s aging aircraft were not credible delivery systems against the sophisticated air defenses of Japan, South Korea, and the United States. Thus, the CIA assessment supports the conclusion that from early in the weapons program, North Korea focused its efforts on developing the ability to mount a warhead on the 800-mile range Nodong missile. Given that twenty years has passed since the deployment of the Nodong, an assessment that North Korea successfully developed a warhead able to be delivered by that missile is reasonable. The experiences of Pakistan and Iran provide another indication that North Korea likely has achieved the necessary miniaturization for the Nodong. The warhead design China gave Pakistan in the early 1980s had a diameter of about 0.8 meters, according to nuclear weapons experts who examined the design. The warhead was reportedly a solid core design containing about 25 kilograms of weapons-grade uranium. Starting from the Chinese supplied nuclear weapons design, Pakistani scientists miniaturized the design further in the 1980s. By 1990, Pakistan had developed “levitated” designs that compress the nuclear core more efficiently than a crude core design. This innovation allowed for a significantly smaller, lighter weapon. Pakistan’s ultimate design fit on its Ghauri missile, which Pakistan initially acquired from North Korea and then modified and produced itself. This warhead reportedly had a diameter of about 0.6 meters. By 1998, when Pakistan conducted its first underground nuclear tests, it had reportedly already developed a miniaturized warhead for the Ghauri missile. Iran may have developed an effective high explosive implosion system, which could be contained within a payload container believed to be small enough to fit into the re-entry body chamber of the Shahab 3 missile. Overall the [IAEA] does not believe that Iran has yet achieved the means of integrating a nuclear payload into the Shahab 3 missile with any confidence that it would work. Nonetheless, with further effort it is likely that Iran will overcome problems and confidence will be built up. Based on information assembled and assessed by the IAEA, Iran was working on a warhead in the early 2000s that had a diameter of 0.55 meters, small enough for the Shahab 3 missile. North Korea and Iran have had extensive missile cooperation; the Shahab 3 is also based on the Nodong missile. Pakistan achieved miniaturization for the Ghauri missile within ten years; Iran reportedly focused on developing a warhead small enough for the Shahab 3 missile early in its nuclear weaponization program. The Ghauri and Shahab 3 were close copies of the Nodong missile. North Korea could reasonably be expected to have made the same priority of building a warhead to fit its Nodong missile and made progress in a comparable time frame to Pakistan. Given that North Korea started at least 20 years ago working on a warhead for the Nodong missile, it is likely that it finished developing one able to fit on the Nodong in the early to mid-2000s. Following North Korea providing Pakistan with the Ghauri missile, A.Q. Khan and his colleagues at the Khan Research Laboratories transferred centrifuges and centrifuge-related equipment and materials to North Korea. Each side gained considerable knowledge of the other’s secret nuclear programs. In his 2004 confession to the Pakistani government, following the busting of his network, Khan stated that North Korea’s nuclear weapons program was more advanced than Pakistan’s. He wrote in his confession that North Korea showed him and his colleague Dr. Mizra the “perfect nuclear weapons, technologically more advanced than ours.” Khan also stated that North Korea taught Pakistan how to make krytrons, or fast switches, used in initiating the detonation of a nuclear weapon. Krytrons can be difficult to either make or procure abroad. So, this transfer would have been valuable to Pakistan’s nuclear weapons effort. Khan’s description of North Korea’s nuclear weapons prowess may have been intended to head off accusations of sharing nuclear weapons information with Pyongyang, a charge many believe to be true. Nonetheless, his statement confirms that North Korea had an active nuclear weapons program in the 1990s, and it supports that Pakistan and North Korea shared information about their nuclear weapons programs, although the extent of sharing cannot be determined conclusively. They likely shared the priority of developing nuclear-tipped ballistic missiles. Earlier, the North conducted two underground nuclear tests, one in 2006 that is often interpreted as a partial success and another in 2009 that achieved a several kilotons explosive yield. It is therefore likely that one priority for the North Korean military leadership was to ensure the tests contributed to the furtherance of a credible nuclear deterrent. And as mentioned above, such a deterrent requires a missile-deliverable nuclear warhead. Thus, it is reasonable to conclude that North Korea focused these tests on furthering its ability to mount a warhead on the 800-mile range Nodong, its most reliable missile. The relatively low yield of the second device detonated in 2009, from 2-7 kilotons (compared to the roughly 20 kilotons achieved by the Nagasaki bomb), can be interpreted as a result of miniaturization. In this case, the diameter of the device was achieved at the cost of explosive yield. Regardless of North Korea’s progress prior to the February 12, 2013, test in miniaturizing its nuclear warheads, this underground nuclear test has likely advanced North Korea’s nuclear weapons program. North Korea could have improved the reliability of its designs and learned to further miniaturize its warheads for ballistic missile delivery. One important outstanding question is whether the test involved only plutonium or highly enriched uranium alone or in combination with plutonium. 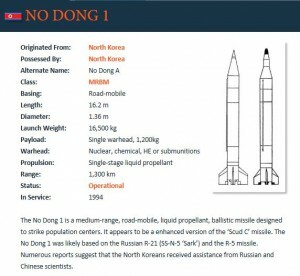 ISIS assesses that North Korea has the capability to mount a warhead on the Nodong missile, although it recognizes the uncertainty in this estimate and that the warhead’s reliability cannot be ascertained. The test on February 12 could have, as North Korea stated, demonstrated this capability. North Korea probably cannot deploy a warhead on an ICBM. However, with additional effort and time, North Korea will likely succeed in developing such a warhead too. More broadly, additional underground nuclear tests are bound to help North Korea produce a more sophisticated nuclear weapons arsenal that is both more deliverable and more deadly. Statement of Dr. A.Q. Khan, March 2004. This document is Khan’s confession to the Pakistani government about his proliferation activities, but he also discussed China’s provision of weapons-grade uranium. China’s provision of the weapon design was first reported in the mid-1980s and has been confirmed by several reporters since then. This author was also told about the provision of both the weapons-grade uranium and the weapons design by U.S officials. Albright and Kevin O’Neill, Solving the North Korean Nuclear Puzzle (Washington DC: ISIS Press, 2000), p. 16. A commercial satellite image of this area is shown on p. 65. The high explosive test site is discussed on p. 100. Solving the North Korean Nuclear Puzzle, op. cit., p. 129. Albright, Frans Berkhout, and William Walker, Plutonium and Highly Enriched Uranium 1996 (Oxford: Oxford University Press and SIPRI, 1997), p. 308. The Khan network transferred the Chinese design in the early 2000s to Libya (see Peddling Peril, op. cit.). Libya relinquished this design as part of its nuclear disarmament, and nuclear weapons experts from the IAEA and the United States examined it. Albright, Peddling Peril (New York, Free Press, 2010), p. 124. This finding is from an IAEA report that can be found on the ISIS web site: http://isis-online.org/uploads/isis-reports/documents/IAEA_info_3October2009.pdf . Albright, Paul Brannan, Mark Gorwitz and Andrea Stricker, “ISIS Analysis of IAEA Iran Safeguards Report: Part II – Iran’s Work and Foreign Assistance on a Multipoint Initiation System for a Nuclear Weapon,” ISIS Report, November 13, 2011, http://isis-online.org/isis-reports/detail/irans-work-and-foreign-assistance-on-a-multipoint-initiation-system-for-a-n/. Albright and Paul Brannan, Taking Stock: North Korea’s Uranium Enrichment Program, ISIS Report, October 8, 2010. See also Peddling Peril, chapter 7. Frank V. Pabian and Siegfried S. Hecker, “Contemplating a third nuclear test in North Korea,” Bulletin of the Atomic Scientists, August 6, 2012. The authors describe the different nuclear explosive yield estimates for the 2009 test, and they derive their own yield estimate of 4-6.9 kilotons, based on a more accurate determination of the depth of the 2009 test. Researchers at Lawrence Livermore National Laboratory estimated that the yield did not exceed two kilotons.